fatBuzz: What is Responsive Web Design? Over the festive period we received an email from a prospective client who has known the business for several years now. However, this client never realised we did website design until we mentioned Chris's recent arrival to the design team in a blog post. fatBuzz started out as a traditional design company doing design for print, then we moved into web design in the 90's and Web 2.0. As many of you know, we run the monthly New Media Breakfast where we deliver presentations focused on the need for and importance of social media. This is potentially why most clients think we’re only a social media agency when we’ve actually had 25 years experience in design! This year, at fatBuzz, we aim to ensure you receive regular updates, spanning the range of our services, through our blog posts. We will not just bring you news, events and updates from the world of Social Media but also from those of Design, Marketing and Video Production. Given the high volume of people now using mobile devices such as smartphones and tablets to access the Internet, it is essential to have a mobile-friendly website. Furthermore, with the plethora of tablet devices and smartphones now on the market it’s becoming near impossible for software developers to continue creating websites for each and every resolution and device. However, there is a new standard that goes further than a simple ‘mobile enabled’ option for your site; in other words, Responsive Design. 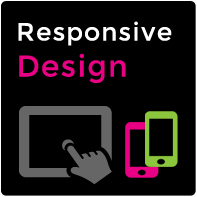 Responsive design involves flexible grids, layouts and images allowing one to swiftly move between devices and maintain website readability. The site will respond to the user’s behaviour and environment based on screen size, platform and orientation. As the user switches from laptop to tablet device or smartphone, the website will automatically switch to accommodate appropriate resolution, image size and scripting abilities. This has far more capabilities than suggested by the term ‘mobile enabled’. Responsive design is increasing in popularity as a result of the rising number of users accessing the Internet on multiple mobile devices. This type of design opens up websites to a huge number of users that were before repelled by the incompatibility between their devices and the simplistic ‘mobile enabled’ website. If you have any queries about responsive design please drop us an email and we’ll be more than happy to discuss this with you. For the most part, RWD is definitely a welcome sight for mobile internet users. It would certainly fit on their mobiles without having to do any adjustment on their part.